Given the reports coming out of the Aloha State in the lead up to the contest, Gov. Neil Abercrombie's (D-HI) renomination loss this past Saturday may not have been that surprising. But Abercrombie's defeat at the hands of little-known state Sen. David Ige (D) was shocking in terms of the margin. In fact, with 99% of precincts reporting (a couple precincts weren't able to vote due to storms and will vote this Friday 1), Abercrombie's defeat by 36.1 points is the largest primary loss by any sitting governor in U.S. history. The old record was held by Preston Smith (D-TX), who lost renomination in 1972 by 35.2 points, receiving only 8.7% of the vote and failing to make it to the Texas Democratic runoff, which Dolph Briscoe went on to win. In states without runoffs, the next-biggest loss is Frank Murkowski's defeat by Sarah Palin in Alaska's 2006 GOP primary. 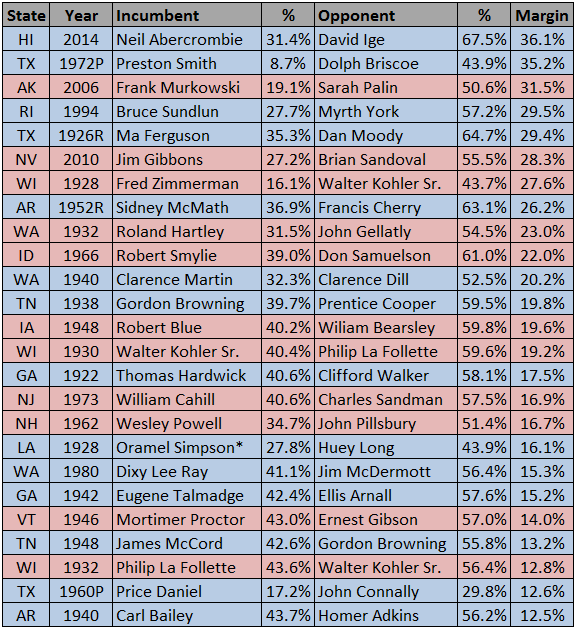 Below is a table of incumbent governors who lost by at least 10 points when seeking renomination. And please, feel free to e-mail us at goodpolitics@virginia.edu 2 to let us know if we missed a result. Pre-1950s primary results vary in availability! Notes: *Unelected incumbents seeking renomination; P – primary election result in which the incumbent failed to make a runoff election, R – runoff election result. Sources: CQ Press Guide to U.S. Elections; election archives of Iowa, Montana, New Jersey, Ohio, Oklahoma, South Dakota, Vermont, and Wisconsin.